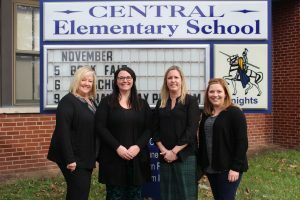 Pictured from left: YSS Director of Community Based Services Jill Eddy, YSS School Based Mental Health Coordinator Trista Rager, Central Elementary School Principal Erin Cuffaro and Southwest Energy Community Relations Manager Amy Dobkin. Southwestern Energy partnered with the United Way of the Upper Ohio Valley to host the company’s Southwest Appalachia Charity Clay Shoot earlier this year. The sold-out event, with more than 200 participants, raised $80,000 for the United Way. Amy Dobkin, community relations manager for Southwestern Energy, worked with staff on choosing a program that would have a large impact on the Upper Ohio Valley and address pressing issues the community is facing. The Expanded School Mental Health Program is a program provide by Youth Services System, a United Way Agency. Coordinators work alongside school counselors and administrators to plan for necessary school-wide prevention and early intervention services. The program consists of drug and alcohol prevention, bullying prevention, anti-violence, suicide prevention and life skills. Coordinators are able to identify at risk students and refer them for additional treatment as needed. This program is currently in junior highs in Brooke, Ohio, Marshall and Wetzel counties. This new funding expands the program into an elementary school within each county: Central Elementary (Marshall County), Steenrod Elementary (Ohio County), Brooke Intermediate South (Brooke County) and Long Drain Elementary (Wetzel County). The funding will also assist in additional programming for at-risk students. The program already existed at Moundsville Middle School.